The pumpkin spice lattes are out, the air is finally getting cooler (in that abrupt way that Texas likes to deliver it) and the houses are decorated with cobwebs, skeletons, and pumpkins. This is fall in Frisco, and this is the Halloween season that reminds us of our childhood. This is by far my favorite time of year and favorite holiday. Over the last couples of years, I’ve compiled my list of scary movies for you to watch to really get the full haunted Halloween experience! Well, it’s time to do that again, but this year let’s look at movies we can watch with the whole family, from the youngest to the oldest! Goosebumps was released in 2015 and is based on the books written by R.L. Stine. The movie pulls from these books with favorite characters making their appearance, as well as actor Jack Black who plays R.L. Stine himself. The plot is simple which is good for the younger audience. It follows a teenager trying to save his town with R. L. Stine’s help after all monsters, demons, and creatures from the Goosebumps franchise begin to escape from their books, wreaking havoc in the real world and trying to take over. Much like the books, it has some creepy moments, but enough humor to keep things light. It’s a great movie to watch with your children, just in case the youngest ones feel a little scared! A sequel, Goosebumps 2: Haunted Halloween just released in theaters as well! Based on Neil Gaiman’s popular “children’s horror” novel, Coraline has some similarities with Alice In Wonderland, but darker. Coraline is the story of a young girl with a great imagination that moves away from her friends to an old house surrounded by oddball neighbors. Her parents get caught up in the everyday hustle of work and life. Coraline is forced to find her own way and meet new people, which is hard to do with her unique neighbors. Coraline discovers a secret door while playing, behind which leads to another world that from afar looks like mirrors her own. However, it’s actually different in many ways – and better. As she begins to grow in happiness she meets in her discovery, Other Mother and the rest of her parallel family who tries to keep her forever. The movie has the typical feel of a Tim Burton movie as it’s heavily influenced by his work. The darker fantasy parts are creepy and some younger viewers might not be ready for it. I would suggest viewers be at least 8 years old, but of course, that’s up to you. This is a fun movie for both kids and adults (especially for those adults who remember hearing stories of weird neighbors or creepy houses when they were a kid). The story takes place when parents of twelve-year-old DJ Walters leave town for the weekend, leaving him in the care of his babysitter, Zee. DJ has spent most of his time spying on his elderly neighbor Horace Nebbercracker, who confiscates any item landing in his yard. When DJ’s best friend Chowder loses his basketball on Nebbercracker’s lawn, DJ is caught by Nebbercracker trying to recover it, but the enraged owner apparently suffers a heart attack and is taken away by an ambulance. That night, DJ receives phone calls from the house with no one on the other end. Eavesdropping on Zee’s boyfriend Bones, DJ hears him tell Zee about losing his kite on Nebbercracker’s lawn when he was a child, and that Nebbercracker supposedly ate his wife. That should be enough to get anyone going and excited to see what happens on this adventure. The movie is not overly scary but still has that fun Halloween element. Now Halloween would not be complete without this one! The Great Pumpkin made it’s debut in 1966, so needless to say this has been a true classic for years. The story of imagination and enjoying the spirit of the holiday with friends is something that children not only can relate to but should never forget. This is by far one of my favorite Charlie Brown films and I personally look forward to watching it every year. It’s familiar, stirs up memories from my childhood, and it’s perfect for the youngest little ones in your household. While there are hundreds of movies to choose from, we all have our own threshold for what’s appropriate for our children at their various ages. Consider checking online resources such as Common Sense Media to read reviews and perspective from other parents. 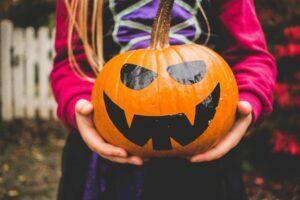 Once you’ve identified those Halloween movies that feel right for your family, turn out the lights, grab some popcorn (or candy corn), and make it a Halloween Movie Night! 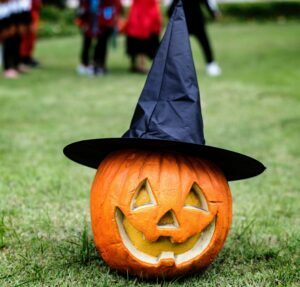 It’s a great way to get the stretch out this fun season and enjoy Halloween longer than a few hours on the 31st.